Under Merkel Germany’s economy has boomed. Her 2013 election result with nearly 42% of the vote was remarkable after two terms in office. But how does she lead? She works with allies in her own and other parties: her previous centre-right government worked with the left-wing opposition to garner support for the Eurozone survival mechanisms. She gives time to the political process and shows flexibility in the search for consensus, but not too much. Her latest coalition agreement with the left, that is now subject to a vote by social-democratic party members, contains drips for boosting demand in the economy, as it redistributes some income by increasing pensions and introducing a national minimum wage. Next to striking deals, Merkel makes sure to show from time to time who is in charge, for instance when she took a quick and radical U-turn on phasing out nuclear energy after Fukushima. For the new minimum wage, the social-democrats depend on her: Merkel made sure that their flagship achievement only takes full effect in 2017. So it will be hard for the social-democrats to leave Merkel’s government before that date. Sometimes a leader must make sure that she is needed. People criticize Merkel’s leadership style for being slow, and accuse her of stealing ideas from others. But such a criticism can only come from observers who fail to pay attention to the political structure in which she operates. The biggest party in Germany does not rule from a majority position; it has to gather support to build the largest majority possible before taking decisions. That support has to come from the government coalition partner but also from opposition parties who may control the upper house of Parliament. Obama, who works in a two-party system, needs to peel individual legislators from the opposition party away from their radical position and get them to the centre. Obama has not been able to build alliances in the way that Merkel has done. Perhaps his personality is part of why this is so, as media observe that he is more an academic than an operator, and has difficulties to become chummy with Members of Congress. Chris Matthews reinforces this view in his newest book on the workable and cordial relationship between democratic Speaker Tip O’Neill and Ronald Reagan in the 1980s, though Matthews suffers from the pundits’ syndrome to remember the good and forget the bad things about past leaders. The line of argument focusing on the President’s personality underestimates the political system in which Obama has to work. Though he does not need to make a coalition government and only needs slim majorities, he has to work with Republicans who are in charge of the House of Representatives. The problem today is that a sizeable number of Tea Party Republicans are not interested in policy compromises. What drives them is to make sure their constituents know how radical they are; if not they run the risk of an even more radical challenger in a primary. When Arend Lijphart published his study on democracies in 1999, he hesitated to call the US a two party-system because of the factions inside the Democratic party. The USA resembles by now more a multi-party system without the institutional structure to form coalition governments. This party fragmentation puts it closer to the Italian system which is notorious for its lack of political stability and a never-ending political bargaining with temporary deals. The latest budget compromise between Democrats and Republicans is such a stopgap measure. 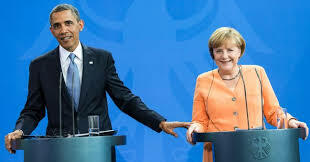 Angela Merkel, like Obama, has radical challengers on her right, who argue that Germany should stop supporting the Eurozone, a policy that requires German taxpayers to do what financial markets no longer want to do: lend money to troubled countries. Political scientists would predict that a German proportionate voting system would allow these disgruntled and radical voices to find the way to the Parliament, and that this in turn would make the search for compromises more complicated as pressure mounts on politicians to move left or right, but in any case away from the policy compromise in the centre. But the 2013 German election has been remarkable for holding off the anti-Euro party. In contrast, two-party systems are classically seen as more stable and gravitating more naturally towards the center of the political spectrum, as they keep fringe parties outside of the political institutions. But that does no longer hold true in America, where the radicals have found a way into a mainstream party, and have fractured the two-party system further. This undermines the power of the executive. A similar phenomenon is happening in the United Kingdom, the most majoritarian of Lijphart’s Western democracies. When David Cameron, who ranks 11th on the Forbes’ list, came to power, his idea was to avoid that the European Union would become a divisive issue within his party. In 2011 he killed a backbenchers’ proposal to have an EU membership referendum; but in 2013 he reversed this position and promised to give the British people an in or out of Europe choice in 2017, in an attempt to appease anti-European members in his parliamentary group. Lijphart contends that consensus democracies are better at including minority views in the political process; he also claims that majoritarian democracies do not outperform consensus democracies on policy effectiveness. This runs contrary to a widely held view, as people assume that a single party government can rule better than an “unwieldy coalition”. Nearly fifteen years later, Lijphart’s claim seems vindicated by the fact that governing in Britain and the USA has become a lot more difficult than before. These democracies will need more exceptional leaders with a higher ability for alliance-building than consensus democracies, where alliance-building is part of the political mores. Oh yes, what about Vladimir Putin, the most powerful leader according to Forbes? It is absurd to compare leaders in terms of power and influence across democratic and authoritarian regimes. Nina Khruschcheva, an international relations scholar, claims that Putin has built his power on state hand-outs to the Russians in a similar way as Evita Péron did in Argentina. Capital flight is one result of this policy. So Putin’s power may be strong now, but Russia will at some point decline as a result of this short-term strategy.